The purpose of this lab was to learn and analyze how antifreeze lowers the freezing point of a solution, or the concept of freezing point depression. Based on the lab, it can be concluded that the higher the concentration of the antifreeze there is in the solution, the greater the freezing point depression will be and a lower freezing point. In the lab the freezing point of water was lowered by 7 degrees Celcius. Freezing point depression is one of few calculations that has to do with colligative properties. A colligative property is something that solely depends on the amount of particles in a solution. Freezing point can be decreased by adding particles to a solution. This works because if there are more particles in between the solvent, the forces of attraction will then be lowered in the solution. The lower the forces of attraction the harder it will be for the particles to get close together and form a solid. The amount of particles in a solution can also determine the boiling point of a solution. The greater number of particles that are in a solution, the more they will block the solvent from escaping a becoming a gas. The less particles there are, the more freely the solvent particles can escape the solution and enter the atmosphere as a gas. Some compounds are better than others to lower the freezing point or raise the boiling point of a solution. When you put a compound in a solution, it will split up into particles. Organic compounds will not split up and remain one compound. If NaCl is put into a solution, it will split up into Na+ and Cl- ions. This means there will be twice as many particles than if it were an organic substance. Something even better would be MgCl2 which would split up into three particles instead of one or two because there will be two chlorine ions for every magnesium. This concept is known as the van't Hoff factor. To calculate the freezing point depression you multiply a constant by molality by i (vHf). The i is calculated based on how many particles something splits into. Therefore the greater the i value, the more the freezing point will drop. 3. Some of the sources of error in this lab can include impure water and improper measurements. Ways to reduce the error would be to make sure that the water used has no impurities. Another way would be to check all of the instruments in the experiment and make sure they are perfectly zeroed and are functioning properly. I do not believe freezing point depression could be used for substances that are not soluble in water. Water will just be displaced by a nonsoluble substance instead of being mixed with particles that are soluble. The water molecules will still be next to each other. The freezing point will be lower than pure water because the ionic compound will split into four different particles. It will greatly decrease it because the i factor is 4. You can infer that water is one gram per milliliter in this investigation. I believe this method would be practical for determining the molar mass of other soluble substances. 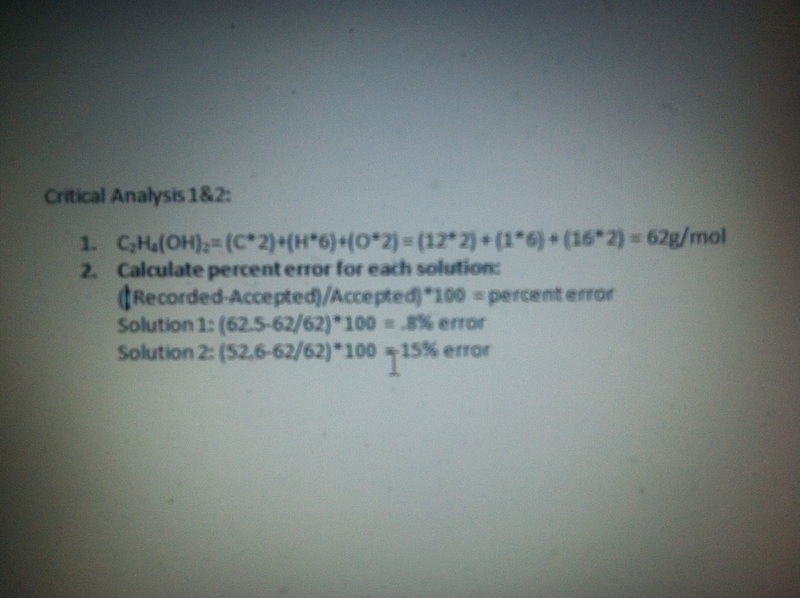 This is because you can use the molality and calculate the moles of the substance. Then by dividing the grams by the moles it can calculate the molar mass. If it is not soluble you will not be able to calculate the molality because the particles will not dissolve.